An LAPD Cadet Commander adjusts his hat before the LAPD Cadet Program Graduation of the cadet "Class of 7-2014". Lt. Daren Diviak is daily reminded of the violence of the streets as he passes a memorial dedicated to colleagues who lost their lives in the line of duty. He works for the Operation Safe Streets Bureau of the Los Angeles Sheriff’s Department, which patrols the streets of South Los Angeles and nearby cities like Compton, where dozens of streets gangs fight for turf. “We just had a murder over here last week,” said Diviak as he pointed from his patrol car, “where a guy was shot and killed. They chased him down and shot him.” A young girl was grazed but survived. Diviak has driven these streets for decades and can identify the graffiti scrawled on fences and buildings that rival factions use to mark their turf, their names taken from streets and neighborhoods — Bounty Hunter Bloods, Swamps Crips, Fruit Town Piru, Tree Top Piru. Policing here may involve calming family members who are involved in an argument, or responding to a shooting. “Once the sun goes down,” Diviak said, residents are “prisoners in their own home. They stay indoors, they don’t go to the stores.” When people hear gunshots, he said, they stay away from the windows. The FBI estimates that more than 30,000 gangs in the United States claim more than one million members, figures that include street, prison and outlaw motorcycle gangs. U.S. officials say that in Los Angeles and Chicago, gangs are responsible for at least half of the murders, and 13 percent of killings nationwide. Many gangs have ties to international cartels. Police say drug money and guns fuel the ongoing violence. Diviak is on the front lines of the battle against the gangs, but his approach to the problem contrasts with the remedy recommended by President Donald Trump, who has embraced a hardline approach to deal with the problem. Trump has focused on the threat from the trans-national gang MS-13, or Mara Salvatrucha, which began in Los Angeles in the 1980s and was transplanted to El Salvador by gang members deported from the United States. The gang is known for torture and brutal killings, and Trump has said that stepped-up enforcement of U.S. immigration law will curb its activities. But in California, where an estimated 10 million immigrants live, police in Los Angeles largely take a different view. They say that immigration enforcement is not their job and only complicates the challenge of law enforcement. 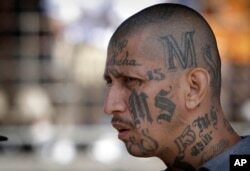 FILE - a gang member of MS-13 attends mass at a prison in Ciudad Barrios, El Salvador. MS-13, or the Mara Salvatrucha, is believed by federal prosecutors to have thousands of members across the U.S., primarily immigrants from Central America. Following a roundup of MS-13 members in Los Angeles in May of last year, Los Angeles Police Chief Charlie Beck said the arrest had “nothing to do with their immigration status. This has to do with their criminal status.”He added that many of the witnesses that made the arrests possible had immigration issues of their own. Los Angeles county has 150,000 street gang members, said the Sheriff’s Department’s Daren Diviak. He said when a victim reports a crime, “'Someone just broke into my car… someone just shot at the house, they’re victims'” and officers help without questioning their status. Violent international gangs like the Barrio 18, MS-13, the Crips and Bloods all began in Los Angeles. Law enforcement says the problem is multi-generational and pervasive, affecting the inner city and increasingly suburbs, small towns and rural areas. The toll is greatest, however, in the two major urban areas that vie for the title of the nation’s gang capital, Los Angeles and Chicago.